Jafar Panahi is an Iranian film director, screenwriter and editor who plays himself in the Iranian documentary 3 Faces. This film is about three individuals at different stages in their film careers, who are trying to help each other become the best versions of themselves. When Marziyeh Rezaei, a local girl with dreams of becoming an actress, asks famous Iranian actress Behnaz Jafari for help in convincing her parents to allow her to study at the Tehran Drama Conservatory, the actress goes to Panahi for help. 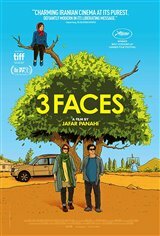 Panahi and Jafari, both well into their film careers, decide to go to the young girl’s village to find her, and convince her parents to allow this young girl to pursue her acting career. On their journey they find that solving the girl’s problems may be more difficult than anticipated, considering her family adheres to traditional ideologies, and Marziyeh is now missing.